ISIS is executing a campaign to terrorize and polarize Europe. The organization has inspired, resourced, and directed attempted and successful attacks in the United Kingdom, France, Belgium, the Netherlands, Germany, Spain, Bosnia, Kosovo, and Turkey since January 2014. ISIS aims to punish countries acting against it in Iraq and Syria. It also seeks to polarize the West by inspiring state and social backlash against European Muslim communities. ISIS believes increased cultural strife will destabilize Europe and encourage Muslims to join it in Iraq and Syria. 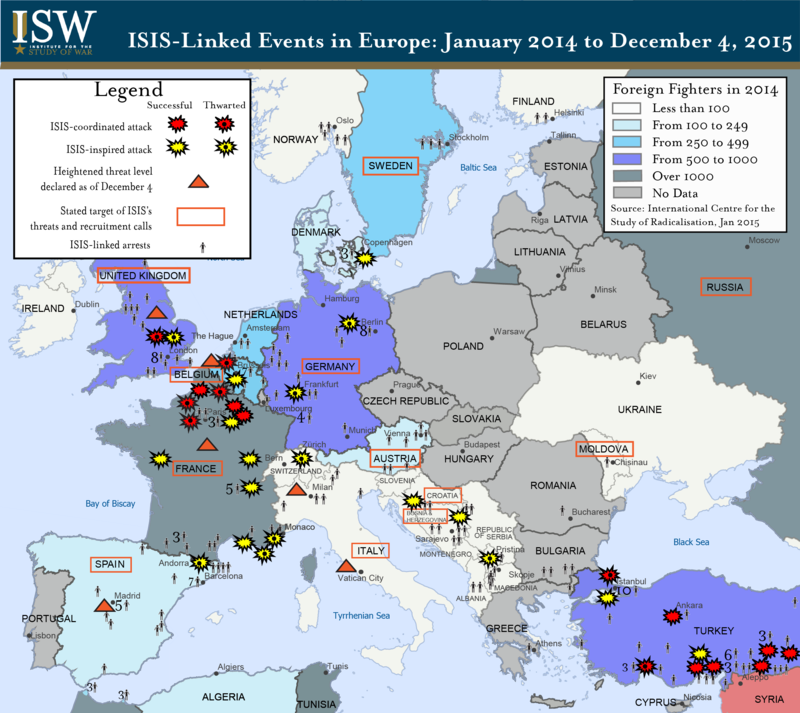 ISIS maintains an extensive support network across Europe to advance this polarization campaign. ISIS benefits from historic recruitment and attack cells developed by al-Qaeda (AQ) and by ISIS's predecessor, al-Qaeda in Iraq (AQI). ISIS has also developed its own network of recruiters who have helped thousands of Europeans travel to fight with ISIS in Iraq and Syria. Finally, ISIS has inspired a widespread base of digital support through its media outreach. ISIS frequently releases recruitment videos targeted at specific European nationalities. The foreign fighters in these videos echo the September 2014 call of ISIS's spokesman Abu Muhammad al-Adnani to "kill any disbeliever, whether he be French, American, or from any of their allies." ISIS's supporters have attempted or executed at least nineteen inspired attacks since January 2014 as a result of this encouragement. The graphic below depicts all attacks inspired or coordinated by ISIS in Europe from January 2014 to December 4, 2015. It also marks locations where ISIS-linked individuals have been arrested between those dates. Locations with more than two arrest events are marked with a number and a single icon. The graphic additionally reflects which countries have increased national threat levels in the wake of the Paris attacks, and shows where ISIS has directed public threats or recruitment calls. Individuals inspired by and responsive to ISIS are active across Europe, particularly in Western countries with high populations of foreign fighters. This activity contrasts with ISIS-linked arrests and attacks in Turkey, which reflect spillover from ISIS's campaigns in Iraq and Syria rather than ISIS's campaign to attack the West. ISIS will likely expand its efforts to direct and resource sophisticated terror attacks in Europe. ISIS used its high-ranking Belgian-Moroccan military commander Abdelhamid Abouaad to coordinate multiple attack attempts in Belgium and France. ISIS may send similarly skilled individuals back to plan terror attacks there or in other historic European jihadist systems, including Spain and Morocco, Italy and the Balkans, or the Netherlands, Denmark, and Sweden. Interconnected human networks in each of these systems may capitalize on inadequate intelligence sharing across European borders in order to plan and conduct attacks. ISIS will also continue to use its global network to inspire and possibly resource terror attacks in other Western countries, including the United States. Reports that a shooter in San Bernadino pledged allegiance to ISIS before or during an attack on December 2 highlight this threat.